Personal hygiene should be maintained. Open defecation should be avoided. Awareness and counselling on cleanliness should be given to children. Child cabinets should be framed according to G.O. 105. As a part of Harita Haram, if more than 100 plants are grown, one care taker is provided from gram panchayath. Plantation should be done only in the schools vch have compund walls. Concentrate on academic standards & allocation of teacherwise schedule be implemented. There should be an Improvement in govt. School enrollment. Govt. Is providing funds for Construction of Toilets, Water Supply, Drinking Water, Compound Walls, Battery of taps. HMs and staff are instructed to maintain healthy environment. Concentrate on infrastructure and maintenance. Communicate to all staff regarding WASH Program. Behavioural changes should be brought in children with the help of Gram panchayath so that will effect overall society. Penalty to children for uncleanliness. 23000 among 26000 schools provided water facility, remaining 3000 are under urban area, municipality will provide water facility to those schools. 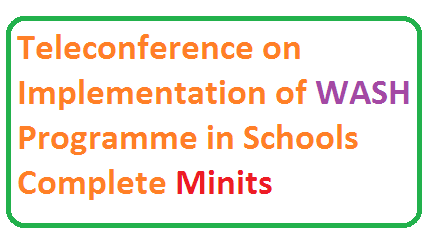 Serious implementation of WASH Program and cousel students to implement it at home. GO : 105, school sanitation committee to be framed. Govt. Schools should submit SMC fund details to SPD in order to clear bills. Except Mahaboobnagar other districts are provided uniforms till 15 Aug.
All the details of this WASH Program are kept in ssa.tg.nic website. Dropout & Enrollment are major problems faced because of uncleanliness. Importance of WASH in schools. Status of WASH Program in telangana. Spread of Diseases through 5Fs - Feaces, Flies, Fluids, Food, Fingers. Feacal and Oral route of transmission of Diseases. Effect of open defecation - diarrhea, hepatitis, cholera, typhoid, polio etc. As a result of this growth will be retarded. Lack of classroom concentration and increase absenteeism. Lack of protection for girls in open defecation. Water pollution results water born diseases. Cognitive skills and self confidence are increased in students through proper hand wash. Provide hygienic conditions in schools. Composition of child cabinet, responsibilities of child cabinets. Course of action by school heads.